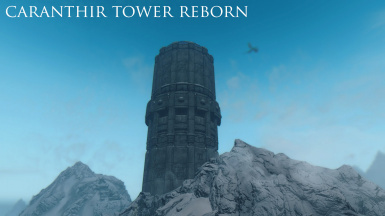 Caranthir Tower is a huge wizards tower located in the mountains of Winterhold. 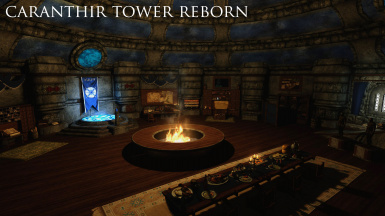 The tower offers features never seen before, customisation, and is more than just a player home. 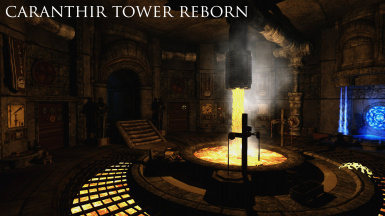 The tower must be restored through a Hearthfire style crafting system or you can simply purchase everything you need. This mod is based heavily around player choice. SkyUI Download the latest version to be safe. SKSE (Skyrim Script Extender) Download the latest version to be safe. Under no circumstances do I give permission for anyone to upload this mod or any of its files to another site other than the Skyrim Nexus without my permission first. Contact with me must be done through my website's contact form. PATCHES: I have created a separate mod page for any minor bug fixes, patches and other such additions to the mod so that it keeps the file section of this mod clean, tidy and easy to understand. TRANSLATIONS: Given the size of Caranthir Tower and the amount of scripting involved with the mod, I would not trust anyone to create a manual translation. Automated translations are also unreliable and I have no way of testing them out and knowing if they are correct. To that end, I will not be allowing any translations of the mod. NOTICE: Anyone who is unable to follow these instructions will simply not receive a response and their message will be deleted. I will also not hesitate to report anyone who cannot respect my wishes in regards to the permissions for this mod. First and foremost, I have to thank simsim899 who I would never have finished this mod without. She’s helped make the mod what it is today with her amazing mesh work, scripting assistance, bug testing, general support and much more. She really is a treasure to the modding community and personifies what this modding community is all about. Go and give her some kind words and digital hugs. Before I continue with the credits here I want to state that keeping track of the files for this mod and resources used has been a very difficult task. To that end, if I appear to have left anyone out for whatever reason, please get in touch and let me know so that I can rectify the problem. Corrected a major bug with the MCM not showing in the game. If you started a fresh playthrough of CTR with version 3.1, completely remove 3.1 from your game and save then install version 3.2 and start fresh. Those who have been playing the mod from version 3.0 or lower shouldn't have any issues, although some elements of the MCM and fixes may not take effect due to the way the game updates saved games. - Corrected issues with the Kel Do Faraan antidote causing instant death for the player. - Corrected the names of each stage of Kel Do Faraan in the active effects menu. - Addressed some grammar mistakes in various places. - Addressed some incorrect information on some message boxes in regards to requirements. - Fixed issue where the entrance receptacle would not allow the player to remove the two-handed version of the sword after defeating the guardian. - Changed the activation button to clear the hint help message whilst attempting to injure the Vault Guardian. - Fixed issue with a floating magic tablet for one of the hidden tablets relating to the Underforge. - Marked all cells inside of the tower as NoRespawn in order to prevent issues with containers and mannequins losing items. - Changed the cell names throughout the mod removing the underscores to prevent save game issues on the SSE version of the game. - Corrected the bad placement of the conjuration pad spotlight in the Lobby. - Fixed issue with a purple texture on Andion's note purse with the Legacy Edition of the mod. - Adjusted some notifications so they read a little better. - Made some changes to Irbran's inventory. - In case of wardrobes not opening upon hiring recruits, keys can now be found around the Dormitory. - Switched the lava orb texture for the standard sigil stone in the SSE version of the mod until a new mesh can be used due to mesh conversion issues from Legacy. - Added an additional MCM option which appears only once you hit stage 5 of Kel Do Faraan. This allows for auto-antidote taking to keep you alive as long as you have a potion on you. This final major update for the mod sees many changes which focus on fixing some remaining bugs and also polishing many aspects of the mod. The changelog got a little crazy and was lost. The main changes with update 3.0 have resulted in the requirement for a fresh save when using 3.0. You can install 3.0 over previous updates, but without a clean game save, you may experience oddities such as items being out of place or things missing. This couldn't be avoided, so only use use 3.0 on fresh game saves. Version 3.0 also resulted in the release of a Special Edition version of the mod which can be found on its own separate page. -Fixed issue where existing saves were having issues with the new Vault Security feature of the mod. - Corrected a spelling error in Irbran's journal. - Fixed incorrect requirement on the vault unpacking message. - Corrected the incorrect file structure for the dialogue fix in update 2.1. - This is the full packages for the mod now and not just an update file. - The guide has been updated to match this version of the mod. - The crafting and recruitment manuals have also been updated for this version of the mod. - The description has been updated both here and on the Nexus to include update information for the future. - The FAQ on the Nexus mod page has been updated to answer some of the most common questions. - Added a receptacle to the Vault entrance which now controls the initial opening of the Vault. You can now also lock and unlock the Vault using the Tuz Vozhlaas sword. - Added some more appearances for Lucan's spirit to assist in guiding the player through the mod. - Added sounds to the magic barriers throughout the mod. - Apprentices Cortoran & Llorak can now be followers. 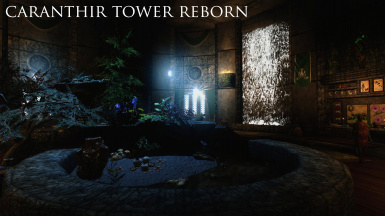 - Added a small camp at the entrance of the tower where Irbran would have slept as mentioned in his journal. - Removed the idle animation from the ledger in the Library as it would get stuck in a loop. - Fixed issue where the learning books would pass time even if it's disabled in the MCM. - Fixed issue with ledgers also passing time if it's disabled in the MCM. - Fixed issue where the antidote for Kel Do Faraan would not last long enough and result in your death a lot sooner than expected. - Fixed issue where a debug notification would show when activating all the magic tablets. - Auto-sort has been made more efficient. - Immersive Storage has been made more efficient. - Improved the collision detection for the sconces in the Alchemy Lab and Lobby. - Made the new clutter selections easier to select. - Fixed issue where two of the guard shield static versions were the wrong way around. - Removed the looting sound from the Ebony Guardian. - Added missing requirement information to paintings and the oven message boxes. - Fixed issue where the secret door to the Underforge sounded like a wooden door instead of stone. - Fixed issue with the ice in the Forge and the Alchemy Lab. - Fixed issue where the sword would not remove from weapon racks. - Fixed issue where the storage shutters not having sound. - Fixed a dialogue issue where the voice was placeholder and not the orc voice type. 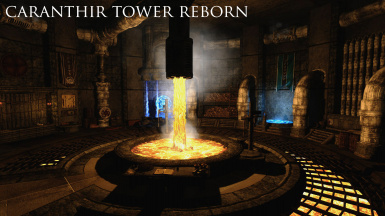 - Increased the amount of restored magicka and health on the regeneration fonts in the Vault. - Fixed issue with tutorial message on the tanning rack in the Forge. - Fixed issue where the Astrologer had no magic. ​- Swapped out the magic barriers in the force with the new light blue versions used in the new Vault barrier feature. - Removed the 20 second block on the auto-sort container. - Changed the voice type of Llorak to make him compatible with the follower dialogue. 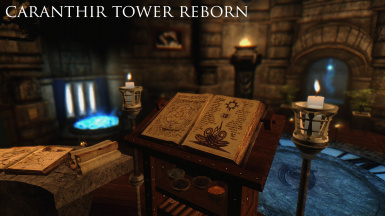 - Two hidden Ayleid coins in the Library have had their enable parent removed and can be found instantly. - Unlinked a number of structural items in the second vault so that they are always visible. - Renamed the Old Codger's bed. - The second Vault can now be restored before the Astrologer is recruited. This should remove some of the confusion and incorporate the second vault into the same system as the rest of the tower. - Changed the linked references for most items in the second vault to match the new craft system for that section of the tower. - Made changes to the crafting requirements for the Vault to match the new changes which have been made. - Changed the wording of the unlock message for the Astrologer to match the new unlock requirements. - Made some small changes to some tutorial messages. - Updated the MCM built-in guide. - Changed the Phosphorescence spell to be Alteration instead of Illusion to match similar spells such as Magelight. - Renamed the Guard Shield rack in the forge to accurately represent the shield types being held inside it. - Made slight changes to the requirements for the Astrologer recruitment on the Mage Quarters ledger. - Re-designed the gold storage to get rid of those damned barrels on invisibility. - Added inventory items to the Astrologer. - Added new dialogue to NPCs to prevent repeated lines. - Added the ability for all recruits to train you in their specialist fields. - Added the ability to restore the Vault. - You can now use new Mead Brewers in the Vault to create your own mead and store them in the new Mead Keg. - Added the ability to change the weather using the new Atmospheric Adjuster. - Added more mannequins in the Vault. - Added a new interaction menu to Irbran's corpse. - Added a new function to snow globes which gives you a blurb on each snow globe's creature contained inside. - Lucan's spirit will now guide you more in the tower's creation process. 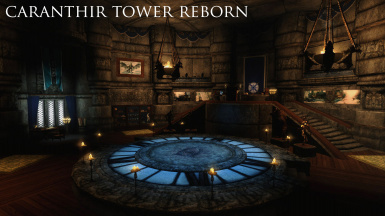 - Added a new area of the tower to discover called the Underforge. - Added Restoration Bolt to the Altar of Magic. - Added storage for the paragon Keys. - Added the option to taint the Tuz Vozahlaas sword which gives it new effects. - Added more storage for unique items in the new Underforge. - You can now open the tower up to apprentices by using the ledger in the Library. - Mage Tallow Candles can now be created at the scroll station. - Fixed issue with newly placed items from update 1.2 showing prematurely. - Fixed issue with some NPC dialogue not ending the conversation. - Fixed issue where NPC training dialogue would not work correctly and in some cases, cause the game to crash. - Fixed issue where the final snow globe message would show every time to pick up a snow globe. - Fixed issue where the Faal Vahlok command power would unequip your gauntlets and gloves. - Fixed issue with missing wall pieces in the Lobby. - Corrected dialogue facial expressions for all NPCs. - Fixed issue where the player could gain access to the utility cell from outside the tower entrance and by using the Ambulatory Portal at the right time. - Added Andion to the player's friends list to prevent him from trying to kill you if he's upset, leading to breaking the start of the mod. - Added a new script to Andion which ends combat with the player if it begins. Works in conjunction with the above. - Fixed issue where one or two of the Elder Scrolls would not appear in the Library display. - Fixed issue where the sconces at the entrance would reflect light during the day. - Fixed issue with some items not having havok prevention. - Fixed issue where you could not unequip the sword after attaching the gem to it. - Fixed issue where the tutorial message for the sword would not show if you already had the sword equipped when attaching the gem. - Fixed issue where the Forge ledger was not initially disabled. - Fixed issue where the rugs in the Forge where not initially disabled. - Fixed issue where the entranceway would disappear for a split second after opening. - Fixed issue with the flooring in the Lobby not being aligned correctly. - Fixed issue where the notification for changing the form of the sword would get spammed on the screen. - Fixed issue where Andion would show up in some terrible locations. He can now only spawn in major cities of Skyrim. - Fixed the offset of the Welkynd Stone stand for the portal in the Mage Quarters. - Fixed issue with the decorative shields in the Forge being visible before cluttering the room. - Fixed boots clipping issue in the container by the Charging Station. - Fixed issue with the dining table food items in the Mage Quarters appearing prematurley for some players. - Fixed issue where followers and other NPCs could not use any of the seating furniture in the Library. - Fixed issue with Blades of Woe display case not accepting both versions of the weapon. - Fixed issue with incorrect settings on some idle markers in the Alchemy Lab. - Fixed bad sound effect on lighting candles in the mod. - Fixed issue where the rubble would not clear unless Animations were enabled in the MCM. - Irbran and surrounding items are no longer visible prior to receiving the note from Andion after reaching level 20. - Renamed the potion storage to better reflect the contents. 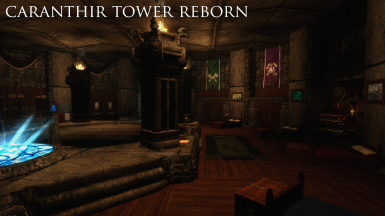 -Removed AI packages on recruits which led them to walk through the Mage Quarters and on to the balcony. - Made a change to the Daedric Lava Whiskey collection notification to reflect a new unlock. - Removed death piles from creature conjured at the Altar of Magic. - Changed the value of the gem Andion gives the player, making it worthless. - Added a new hints system to the mod which tie into tutorial messages. This means they can be disabled using the MCM. - Removed the Alchemy Lab valve in the Forge to prevent confusion with the activation of the Forge itself. - Made adjustments to the tutorial messages in the MCM. - Changed the activator of the sword in the Vault to reflect the name of the sword. - Extended the duration of the Phosphorescence spell and increased the magicka cost to balance the change. - Removed the requirement to craft Forge items. They are now part of the unpacking process of clutter items. - Added a confirmation message to the Chest of Assortments in the Vault. This will now prevent the player from using up a Welkynd Stone if they didn't want to activate the chest yet. - Made changes to Andion's note to mention Irbran's name. - Changed the wait message on the Vault doors when they are busy. - Made minor changes to some dialogue. - Improved the animation length for the rock clearing in the Vault. - Made the sword at the entrance an activator with a message if you have not yet read Irbran's Journal. - Made changes to Lucan's journal to include more information. - Updated the guide section of the MCM to mention to new features and remove the "Coming Soon" tag. 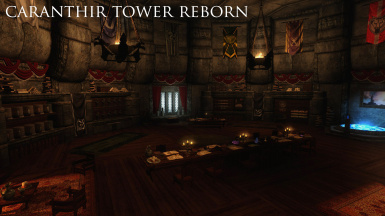 - Improved the look of the clutter piles throughout the tower to better reflect the items being unpacked. - Removed the restrictions to the Lobby rugs which required the player to clutter the Lobby first. - Split the wall pieces for the Library up into four to help with potential lighting issues with some modded games. - Changed the design of the back wall in the Forge and removed the banners. - Improved the look of the slide doors in the tower. - Made a slight change to the colour of the Tuz Vozahlaas gem, including on the sword. - Optimized textures for the 2.0 build. - Made changes to the concealment and revealment spells to account for the appearance of the lava orb. 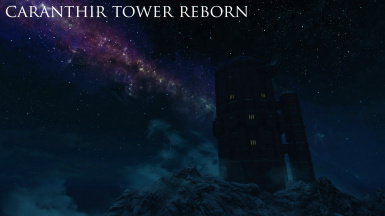 - Sodagh's bed is now built when he joins the tower. - Deleted the bench in the vault. - Fixed the navmesh in the Mage Quarters after the addition of the new seating area by the portal. - Fixed issue with the continuous animation when clearing the rubble in the Vault. - Addressed flickering shelf in the Lobby. - Fixed issue with the potions in the Alchemy Lab not being accessible. - Fixed the new divider moving option in the Mage Quarters. - Corrected an out of place banner in the Library. - Fixed issue with numerous items showing up prematurely. - Fixed mesh alignment issues in the Mage Quarters. 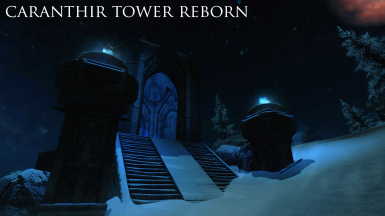 - Fixed issue where the Master Portal was not sending you to Winterhold. - Fixed clipping issue in the Mage Quarters. - Fixed issue with a bookshelf in the Vault respawning. - Covered up the button in the Vault near the rubble until you’ve cleared the area. - Portal effects will now only take place if you have Animations turned on in the MCM. - Adjusted the position of the Library cupboards to avoid clipping with the bookshelves. - Removed the misleading naming scheme on some containers where the item would be marked as “Safe”. - Swapped out a number of static containers with usable versions for additional storage. - Added Immersive Storage to the remaining containers. - Made a fun and interesting change to Jothan’s chest in the Dorms. - Turned the Auto-sort bookshelf in the Mage Quarters into a static version for infinite storage of books. - Removed Sodagh’s balcony AI packages to stop him from walking through the personal Mage Quarters. - Added additional idle actions for Sodagh in the Dormitory. - Adjusted the messages for the lifts to indicate the direction. - Moved the Smelter across slightly to prevent clipping. - Shields should now be able to be sent into storage without issues. - Most unique items can now be placed into the Auto-sort, such as Dragon Priest masks and claws. - Gold should now be correctly sorted into the gold storage in the Vault and the amount should show in the barrels. - There have been changes to form lists to try and better sort items. - Unknown items should now be placed into the Miscellaneous storage to your left by the master bed. - The issue with food should be somewhat fixed but there may still be some food items that end up in odd places or get thrown back. - When using the auto-sort, you will be locked out from using it for 15 seconds to allow it to sort items. - The tutorial message for the feature has been adjusted. 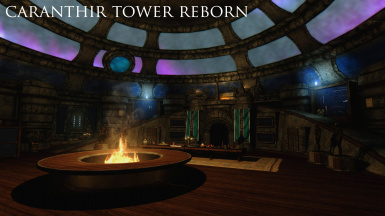 - Added new furniture to the Mage Quarters for relaxing in front of the centrepiece fireplace. - Added additional locations to the Master Portal. - Added the ability to move the dividers in the Mage Quarters to better light the wardrobe when accessing the storage. - Added an additional walking platform at the portal in the Forge. - Added a frost damage enchantment to the Vozahlaas Tuz sword. - Fixed a number of z-fighting issues throughout the mod. - Fixed the two sprinkler controllers in the Alchemy Lab. - Fixed issue with a missing keyword on the Phosphorescence spell tome. - Fixed broken display cases in the Mage Quarters. - Fixed issue with the bench in the Vault which was replacing the player’s currently equipped items with bath robes. - Fixed Ambulatory Portal charging times. - Fixed the Learning Books wait time. - Fixed issue with missing gold barrels in the Vault. - Fixed a number of confirmation messages in the MCM which were displaying the wrong message. - Fixed issue with being unable to easily light the sconces in the Dormitory. - Fixed issue with lighting the fireplace centrepiece in the Mage Quarters. - Fixed the charge time for the Welkynd Stones. - Fixed a number of clipping candelabras. - Fixed a gap with the stairs at the main entrance. - Fixed issue with the dull note on the misc items chest in the Mage Quarters. - Fixed issue where the Chest of Assortment was not giving you a depleted Welkynd Stone back after activation in the Vault. - Fixed issue with an unlinked painting. - Fixed issues with floating items in the mod. - Corrected many spelling mistakes and grammar issues. - Added disable havok to a number of important items. - Added messagebox notifications to the Vault buttons to make their current status more clear. - Changed the ownership of the Recruitment Ledger chair in the Forge to be the Player. - Restricted the use of portals while the player is in combat. - Prevented the player from moving when activating items accompanied with an animation. - Removed the respawn flag from a number of items. - Fixed some dialogue spelling issues. - Re-worded the notifications for perk boosts. - Extended the radius of the perk boost in the Forge. - Swapped out the pull bar in the dome windows Mage Quarters for a magic activator button. - Deleted a number of old references. - Changed a static knapsack to a usable container. - Added a notification on the mead keg in the Vault in preparation for the new meadery feature. - Changed the name of a snow globe in the MCM. - Made improvements to the UV maps of the Charging Station. - Changed the colour of the Dark Elf lanterns in the Forge. - Added sound effects to the dome windows activator. 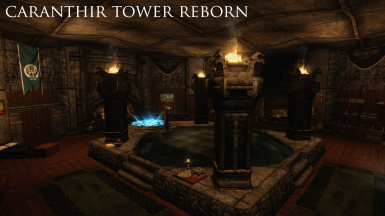 - Added message to the pool to inform the player it cannot be used until the Dormitory has been restored. - Made slight changes the crafting tutorial message. - Made changes to a number of tutorial messages on the MCM. - Adjusted the notifications when using the Learning Books. - Adjusted the auto-save notification when using portals. - Removed the spitting bubbles from the Forge lava. - Made slight changes to the Charging Station menu. - Made changes to Irbran’s appearance to allow the storyline to make more sense. - Raised the height of the bed in the Mage Quarters to allow for the bed and covers to be more noticeable in different lighting configs. - Made adjustments to the messageboxes for clutter crates. - Removed goblets in Dorms which may have been causing crashing. - Made changes to the Ambulatory Portal mesh. 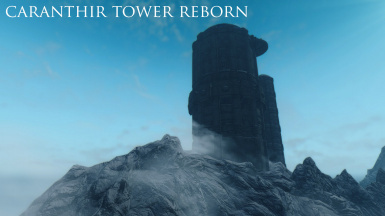 Caranthir Tower Reborn is a wizard’s tower which is hidden up in the mountains of the Winterhold region of Skyrim. Many centuries ago, a high elf named Lucan Caranthir decided to seek the help of some of the greatest minds of Tamriel to create his legacy. Shortly before his death, he hid the tower from others until such day as a powerful mage could uncover its secrets and restore it. CTR includes a number of great features for mage characters such as spell tome creation, the conjuration of powerful beings, recharging of weapons and much more. You’ll also find most of the features that players have come to expect from player homes like auto-sort, unique item displays, mass storage and again, much more. 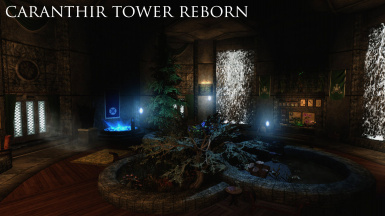 The most highlighted feature of the tower however is the ability to restore it by building the structure back up and creating furniture and other items for the tower. The process is similar to the build your own home style system you can find in Hearthfire and my other mods that I have created. 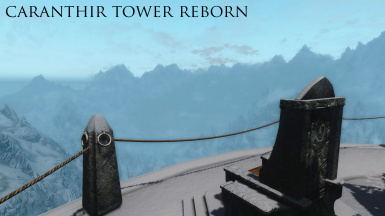 Caranthir Tower Reborn includes the latest version of my crafting system and is the most advanced that I have made to date. For those who don’t like the idea of having to craft their tower, do not worry as there is a way that you can restore the tower without having to be the best blacksmith in the land. CTR is much more than a player home however; it’s a huge undertaking for your main character which will take a fair bit of time to master. 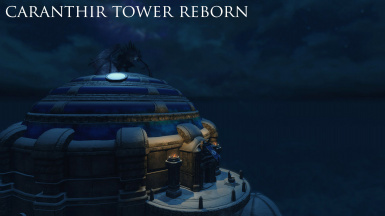 The tower is filled with secrets, back story and other things to keep you coming back for more. This mod comes with a great amount of unique features which make this mod so much more than just a player home. I will attempt to list as many of the main features so that you have an idea of what this mod has to offer. The official mod guide can be found in the files section of this mod page and will help guide you through maost sections of the mod. It's NOT a complete walkthrough but it will help you understand elements throughout the mod which the mod's own tutorials may not cover in full detail. 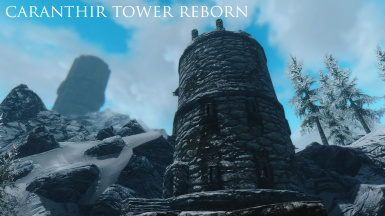 If you wish to watch a walkthrough of the mod, please be sure to check out the amazing series by CouchwarriorTV﻿ as Stu does a great job playing through and highlighting everything Caranthir Tower has to offer with Zatu. You'll find the first episode in the video section on this mod page. For videos on finding the collectibles throughout the tower, check out my own video series for finding everything you may have missed. These can all be found in the video section of this mod page. 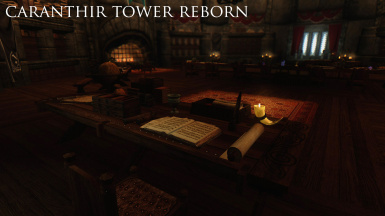 Any mod which may edit the same cells as Caranthir Tower Reborn can potentially have compatibility issues. Known mods include Inigo ﻿(minor visual clipping) and World's Dawn﻿ (container manipulation). I won't be taking any additional time to create patches for these or any other mods as I simple do not have the time. Information regarding existing patches and creating your can be found in the below section. 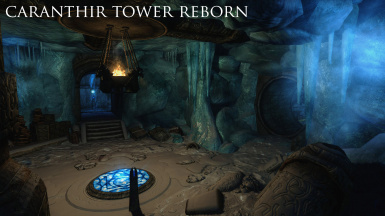 As is standard practice with mods, any mods which edit the same cell space are going to have potential conflicts, so be sure not install any mods in the same area as Caranthir Tower. If you do have another mod which conflicts and you want to use them both, you can check the patches page and see if there’s anything there that can help. There are already some patches already built into the mod which will detect whether or not you have that mod installed and make the necessary changes. One example is the music section in the MCM which already supports Additional Music Project & Symphonies of Skyrim. 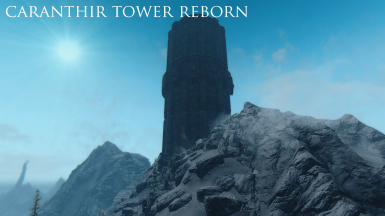 When you discover the tower, the “Houses Owned” statistic in the game menu will be increased by one which makes the mod compatible with mods like Simple Taxes. On release of the mod there will be a number of compatibility patches available for various other mods like Unique Uniques and various other mods, however I do not plan on making too many patches myself. 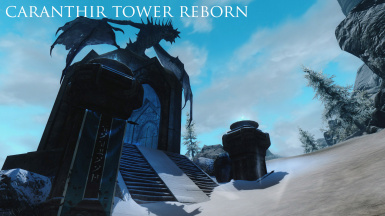 This mod will have a sister page for hosting patches for Caranthir Tower Reborn called the CTR Patches Page as was briefly mentioned above. 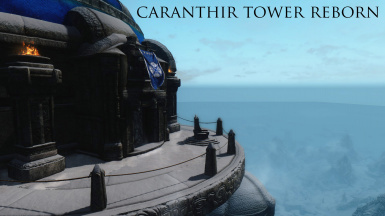 This is where you can find the latest patches for Caranthir Tower and also request to have your own patches uploaded to. This makes it far easier for people to find patches for the mod and allows the community to pitch in with making CTR work with other mods. 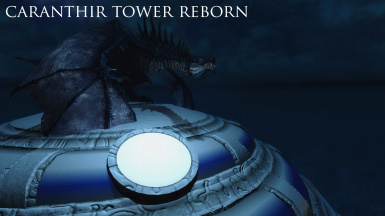 To update Caranthir Tower Reborn, download the latest main file if you don't already have it. Then you need to install any update files to that specific version. For example, if you're running version 2.0 then you need to download and install 2.1 over the top of those main files using the mod manager of your choose. Mod Organizer users need to make sure they merge the files and Nexus Mod Manager users must be sure to overwrite when prompted. Any other mod managers should be close to the same sort of system. You can distinguish a main version from an update from both the name and the file size. Main files are around 200MB+ in size, and the update files will be far smaller. Sometimes a clean install is a good option which involves you removing the mod entirely from your system and then re-installing the latest main file and adding update files on top as mentioned above. Updating mods can be a bit of a pain for mod authors as well as users. Sometimes certain changes you make to your mod may not take effect on existing saves and I'm not aware of a way around this. To that end a fresh character will work best with the latest version of the mod. I try my best to make sure as much as possible plays nice with existing saves, but it's not always possible. Be sure to check the changelogs of CTR over on my website which clearly lays out what you can expect from the latest version of the mod and which elements of an update may not work with save games. First and foremost, I have to thank simsim899 who I would never have finished this mod without. her some kind words and digital hugs. touch and let me know so that I can rectify the problem.